It's that time of the year. Time to unbury the axe and head into Gurubashi Arena of Stranglethorn Vale! 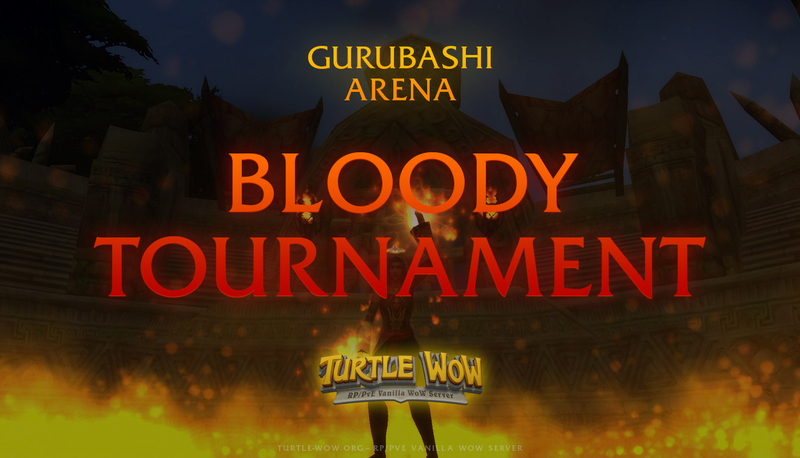 An anonymous local bloody goblin syndicate is launching a big tournament. You'll find Arena Ambassadors in any major city. Join the fray, get cool rewards for murdering friends and enemies in the Battle Ring, where you will experience a bonus x5 honor gaining! There, you will earn [Bloody Coins] for slaying your opponents. You can exchange them for buffs talking to Trixy Gollavix or item rewards taken directly from Zul’Gurub if you give them to Dyah Owon, the item rewarder. You will find them at the entrance of the arena. As an incentive for all players, Dyah Owon will offer repeatable quests to earn some experience from level 1 to 60, as well as the option to exchange [Bloody Coins] for Horde or Alliance Commendation Signets, which you can use to increase the reputation of any major city of your choice. Note: To prevent group camping, you won't earn Bloody Coins if you are in a group. Arena Spectators like fair play! First of, I like that you think of immersive events, that's one way to define the server. I'm a bit worried though: What are the mechanics behind this event? Are there any means to prevent killtrading and such? I'm also not a huge fan of handing out raidgear, but that's another story. Yes! You can teleport from any major city! Awesome rewards. it's not some high end raid gear tbh... just extra incentive to do more pvp. Mechanics on the other hand... I asked myself same question. Hello! The method to check if a target will award you a Bloody Coin is the same used to check if a target will give you honor (despite that same faction kills will award a coin and that you need to do the killing blow). Also, if you are in a group, you won't earn any Bloody Coin, we wan't to encourage 1 vs 1 encounters. Regarding the raid gear you say, you must know that the items we are awarding are blue ones from Zul'Gurub trash mobs, despite two epic rings from random Zul'Gurub boss loot (you need 250 Bloody Coins to obtain each of them). We preferred to offer this kind of loot (which is not OP) instead of creating custom equipment. PD: We want to offer more rewards in a future, also, we would like to add creature champions that will appear from time to time for players to fight them. Yea... basically, gray level players won't give you coins. "60 rogue LF bloody coin duels"
Thanks for setting this event up, it's part of what makes Turtle WoW unique! I'd like to recommend that the arena spectators throw you a coin every now and then if you're in the arena flagged/participating. This would provide an incentive for people to participate when everyone in the arena is 10+ levels below their own level. I spent an hour playing with some level 40+ players but received zero coins since I'm level 58 at the moment. I was thinking a coin every 5-10 min would give 6-12 coins an hour for participating without just giving them away.